The garage is now sufficiently equipped to be used as a workshop. 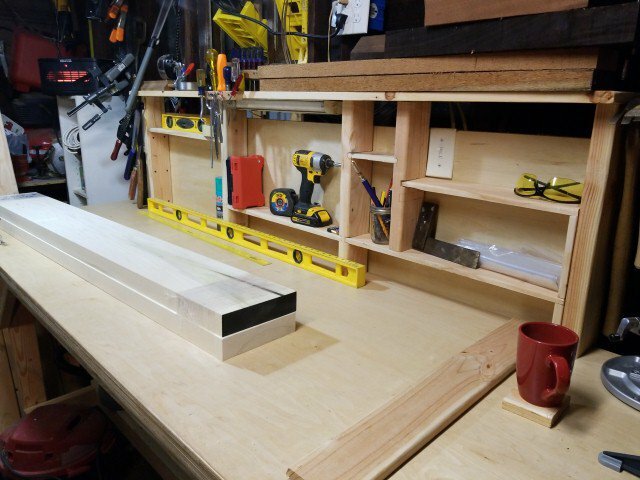 Today, I built some shelves into the back of the workbench. I've been gathering supplies and tools. I got 2 - 5 foot poplar boards cut 1.75" thick. I will be able to make 3 guitars from them. The boards are very well cut to start, but if I'm going to join them, they have to be perfect. I had to plane and sand the two edges so that they were both totally flat. I got it close with a hand plane, but couldn't make the thin line of light between them disappear. So I employed a trick I learned watching the guy from Crimson Guitars. I have an 18" leveling beam that I bought to level frets. It came with 3 fine strips of sandpaper. I needed to use a coarse grit, so I cut my 80 grit paper into two 3/4" strips. I put masking tape on the back. Another piece of masking tape on the leveling beam. Now, super glue on one side and accelerator on the other. This might be hard to see, but I've drawn a squiggly line with a pencil on the edge of the board. When I sand I'll be able to see low spots. I need to keep sanding until they start to come off. Once they're gone on both boards, it should fit together. You see the seam? Me neither. I need better clamps. There will be a short wait while I buy them. Here's the super glue trick demonstrated in great detail. Skip to about 5 minutes if you're short on time. That's a most excellent lesson. I set this up to hold work flat against the bench top. Drilled 2 holes and inserted threaded inserts. This little weird looking guy bolts in when I need it and goes away when I don't. It locks down wood up to about 5/8" deep. I've called those things dogs, but damn if I know what they're supposed to be called. Could be. Dogs are usually pegs that you drop into holes to secure things against lateral force, so, maybe that's how the name came about. They do resemble Odie. Toggle Clamp, but Odie works for me. Hey. Good clamps are pretty expensive. This is $140 worth in 4 clamps. And I got them at Lowe's.... Irwin makes decent stuff in my experience. But not crazy expensive. I'm going to have to make a handful of guitars so I can cost average these investments in tools. Otherwise, at the end of this little project, I'm going to have a $2500 guitar that plays like a $25 guitar. I actually really like the big ones. They have those chunky block ends which are perfect for this application. They even have stops at the end of the bars that double as feet when laid out like I have them. I've got a bit of a low corner, which may be a huge problem, or may not make any difference at all. Seems to me that the latter is more probable. Just one corner? Seems you'd have two low corners if the joint wasn't square with the face. Is that piece not flat as in warped? I think they're pretty flat. Might be just a bit of detritus under the piece on the right. When I lay the straight edge across the far end, there's no gap. No gap in the middle. Just a bit of fall away in the front left quadrant. I'll be sanding and possibly carving the top anyway, so I think it won't matter. I have this lace wood for the neck... I think I said sepele earlier, but it's lace wood. I have 2 boards like this. Hmm, no. That would be weak. The lesser angle from one board would be smarter. Last edited by lumberjim; 11-20-2018 at 03:07 AM. Those are nice looking clamps. Are your balls getting bigger yet? I've got one large ball, but it doesn't have a flat spot, so no good as a paper weight. Thinking of making a work top that tilts in any direction. This is dumb. Just buy a guitar.